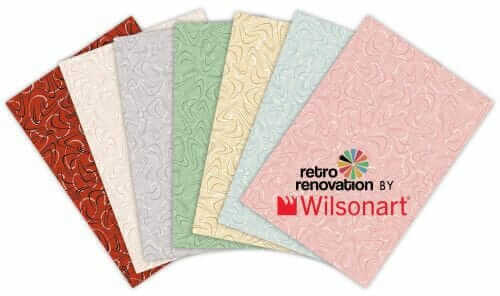 Home » Kitchen Help Category » Countertops » Announcing 7 new boomerang laminates — “Retro Renovation® by Wilsonart” — woot! 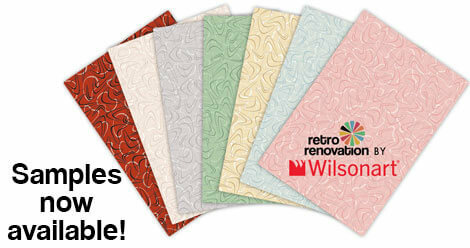 Announcing 7 new boomerang laminates — “Retro Renovation® by Wilsonart” — woot! Drum roll, please: Today we unveil the seven new boomerang laminate color palettes that we have developed in collaboration with Wilsonart — the new Retro Renovation® by Wilsonart® collection! Kate and I are in Las Vegas at the Kitchen and Bath Industry Show (KBIS) 2016 — we’ll be meeting with design media and kitchen and bath professionals all day today and tomorrow to show them the new designs. Meanwhile, here are all the official press materials, including photos of the seven colorways. We hope you like them — in terms of getting additional retro designs into the pipeline, it’s a start! LAS VEGAS, NV (January 19, 2016) – Put on your poodle skirts! Make some milkshakes! Stack up those 45s! 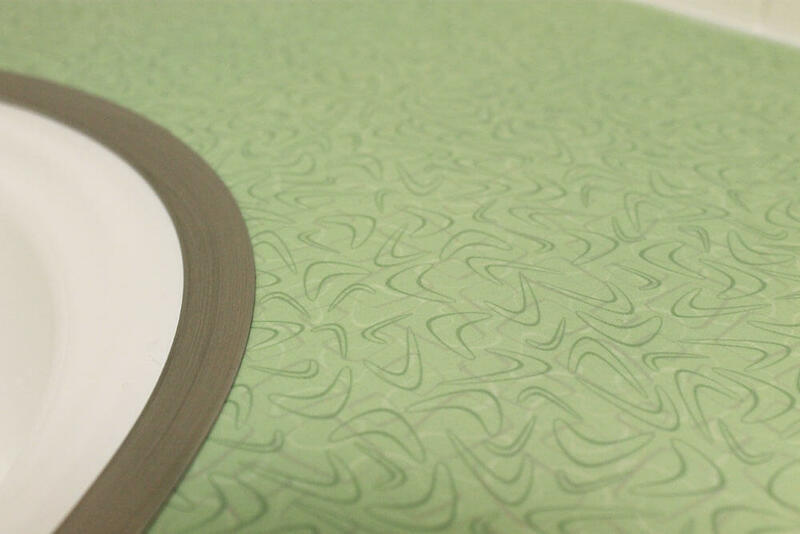 Wilsonart, a leading manufacturer of decorative engineered surfaces for 60 years, has teamed up with home design bloggers Pam Kueber and Kate Battle of RetroRenovation.com to introduce Retro Renovation® by Wilsonart, seven new colorways of boomerang laminate designs. Developed to coordinate with both vintage materials and new products available in classic retro colors, the seven new colorways were designed to appeal to the growing number of homeowners who want to bring popular colors from the 1940s, 1950s and 1960s into their kitchens and bathrooms. 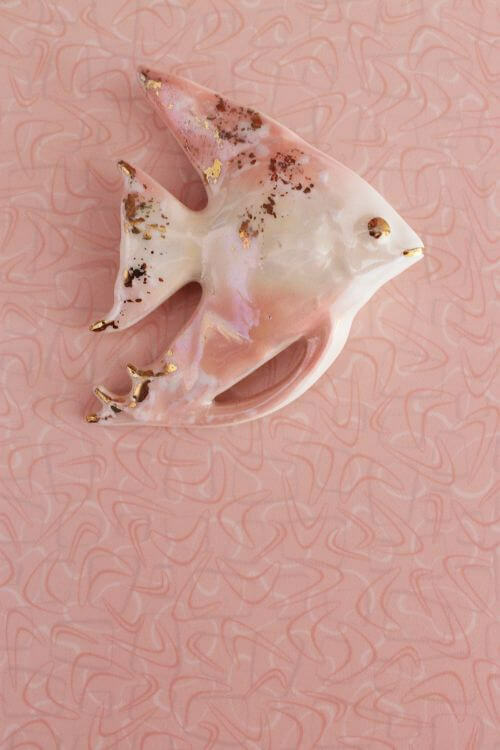 Retro Renovation® First Lady Pink – A warm pink color popularized by Mamie Eisenhower in the 1950s, super popular in pink bathrooms and great for a sweetheart kitchen, too. 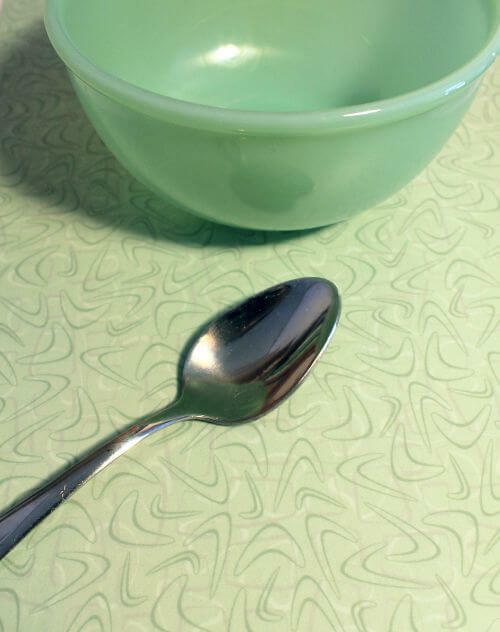 Retro Renovation® Delightful Jade – Inspired by vintage jadeite milk glass, a beloved color and collectible among retro enthusiasts. Kate used this color in her 1962 bathroom. We love it for vintage-style kitchens, too. Retro Renovation® Créme Caramel – A delicious pale golden yellow background with butterscotch boomerangs. This colorway looks great with wood cabinetry. Retro Renovation® Rock ‘n’ Roll Ruby – The only design that is not tone-on-tone, this one is a bold retro design inspired by diners with waitresses on roller skates. 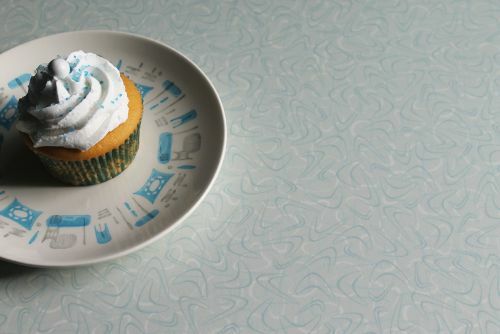 Retro Renovation® Aqua Ripple – A soft, retro aqua that also plays well with blue. Retro Renovation® Nostalgic Gray – A warm, relatively light gray that would work well as a neutral or with color-coordinated tiles or décor. Retro Renovation® Friendly Beige – A warm, light rosy-beige also intended as a neutral. 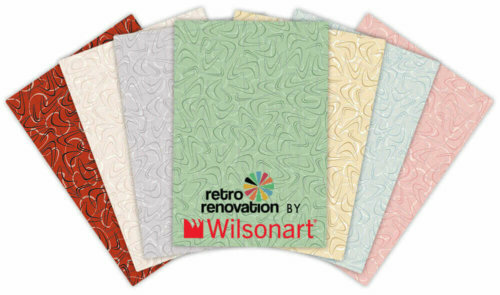 Retro Renovation® by Wilsonart will be available online February 1. 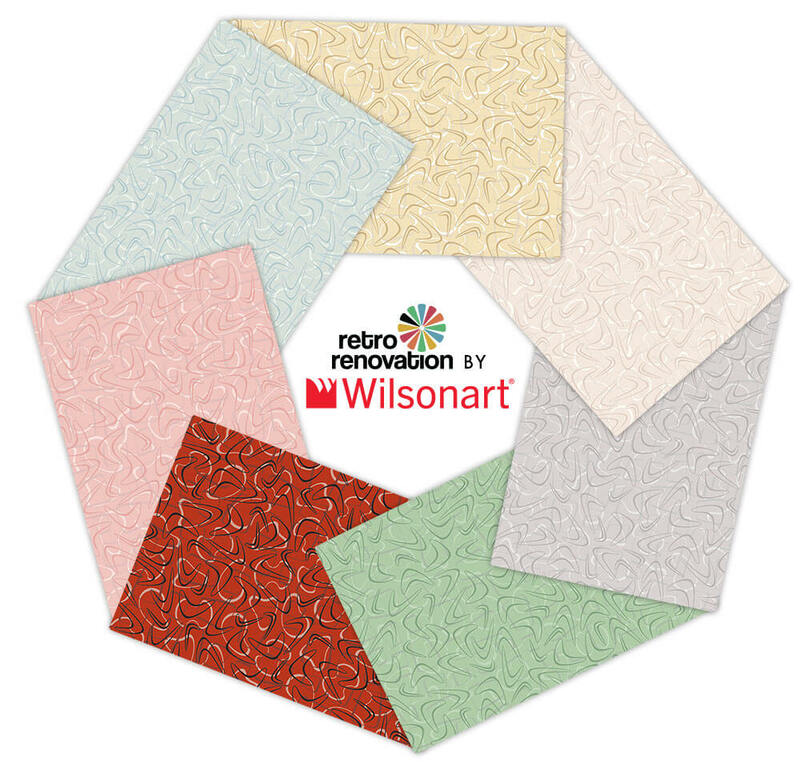 For more information about Wilsonart products, including the new Retro Renovation by Wilsonart, visit www.wilsonart.com or call 1-800-433-3222. Wilsonart is one of the world’s leading manufacturers and distributors of High Pressure Laminates and other engineered surfaces used in furniture, office and retail space, countertops, worktops and other applications. The company operates under the Wilsonart®, Resopal®, Polyrey®, Arborite®, Ralph Wilson® and Durcon® brands and has achieved success through a combination of outstanding service, high-quality products and a focus on continuously redefining decorative surfaces through improved performance and aesthetics. For more information, visit www.Wilsonart.com or connect with us on Facebook, Twitter and Instagram. 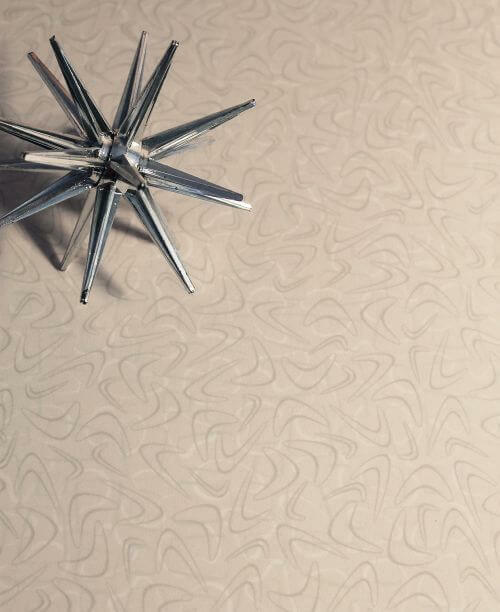 Wilsonart already had an established “Retro” Virtual Design Library Category in several midcentury styled patterns and colorways. This retro pattern includes three abstract characters – line-drawn boomerangs intermingled with a loose figure eight and a rounded rectangle. To refresh the palette and open the design to more potential uses, Pam and Kate envisioned lower-contrast, tone-on-tone colorways that would meld with the most popular midcentury bathroom and kitchen colorways, especially those calling for warm pastels. In the new colorways, Pam and Kate wanted to see the boomerang more clearly “floating” on top of these other elements to ensure dynamism, but with carefully controlled contrast. Pam and Kate compiled design boards that were the influence for each of the colors. The boards included both new products available today in appropriate retro colors, such as tile and flooring, as well as vintage materials, like wallpaper, chalkware fish, hardware modules and even several cabinet doors. These products – both vintage and new – reflect what actual renovators might be using or decorating around in their kitchen and bathroom projects today. Pam and Kate created collages that would give even more life to the boards and to evoke the happy feeling and vibrant color that retro décor inspires. Wilsonart’s design team selected colors for each character of the design to get the right combination. 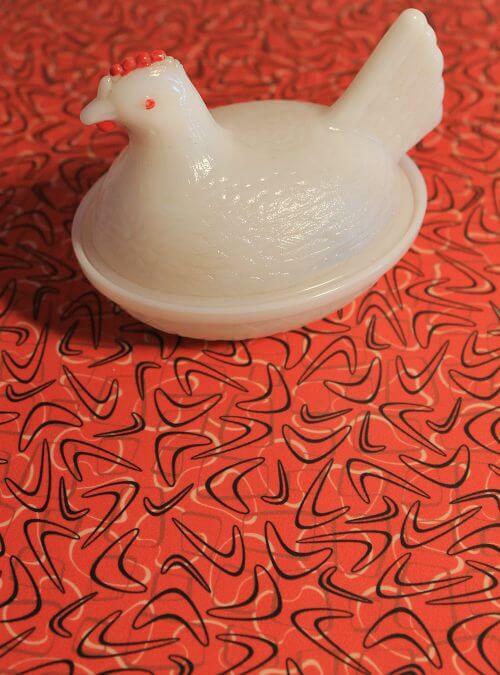 A sample was generated and compared against the design boards for coordination. Through each phase of this process, the slightest alteration needed evaluation to ensure a perfect balance of color and contrast. Laminate samples were sent to Pam and Kate for review. 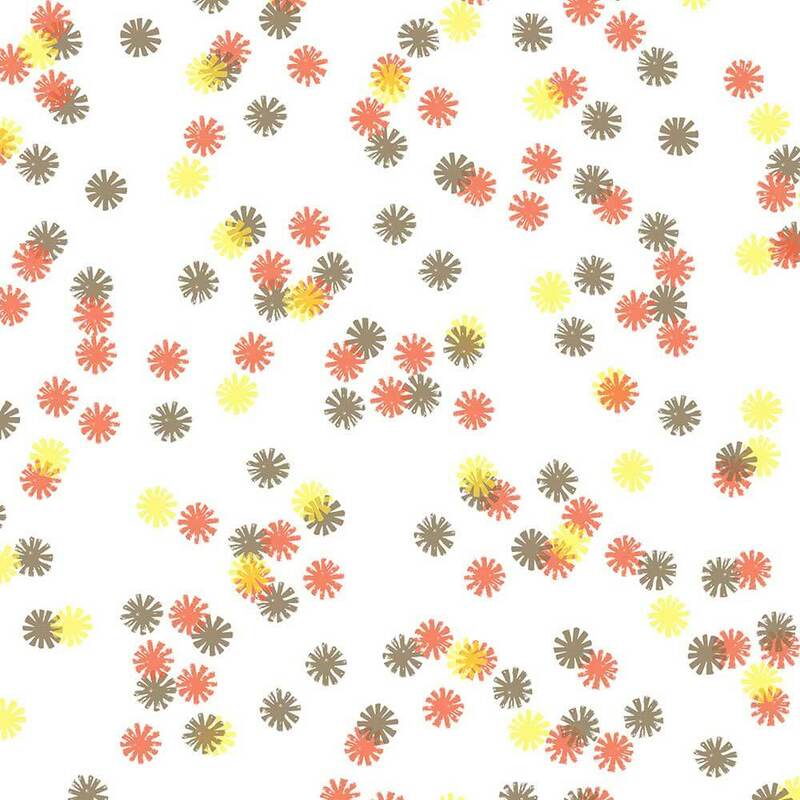 Changes to one layer of any design potentially impacted the whole look of the pattern, affecting intensity or color. Some of the retro shades were more difficult than others to get just right, so the review process continued until the seven new colorways were achieved. Epic, huh? Yup. This has all been pretty epic. We are at the show today, so may not have a lot of time to respond to comments until much later. Wish us luck and lots of publicity for The Retro!!! When can I get samples and/or buy these? UPDATE FEB. 1: The designs are now available — you can order free 8′ x 10″ samples within their Virtual Design Library Retro collection. Of course, it’s important to get samples to see this in place in your space; as you can even see from our photography and graphic representations, colors render differently on screen vs. in place. UPDATE: You can buy these online at Home Depot. You can also go to a specialty retailer like Heffrons A Moment in Time Retro Design [disclosure: A longtime Retro Renovation advertiser). NOTE: When I ordered samples from Wilsonart to test the system – a list of dealers in my area came up alongside my order in the Cart Checkout. Disclosure: I want readers to know: I do not make money if you buy this laminate; “the deal” that I have with Wilsonart includes other elements of consideration. 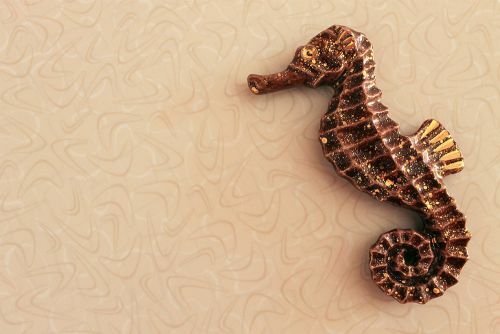 For example, on Feb. 1 they will launch an advertisement on the blog, for which Retro Renovation is compensated. 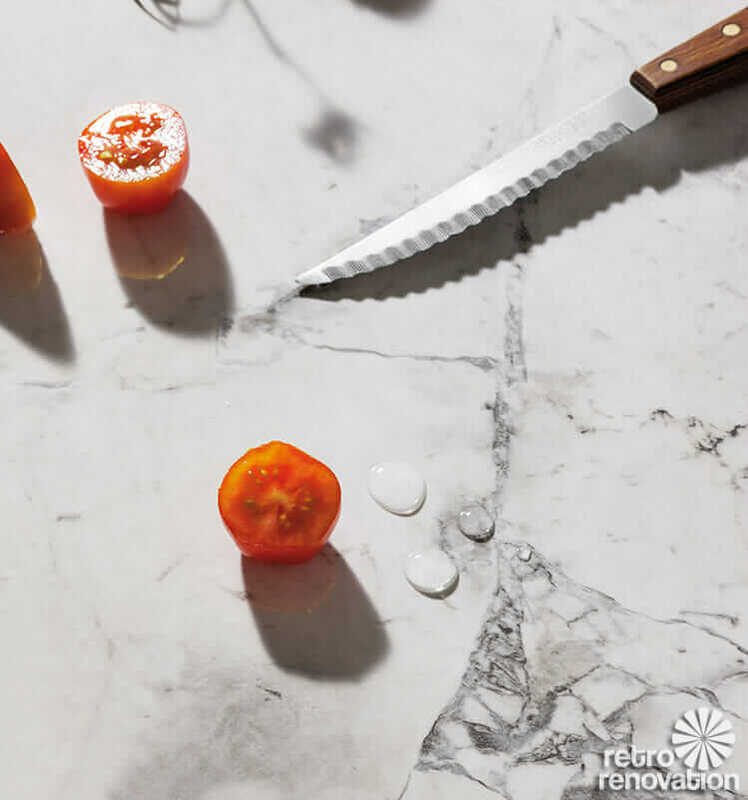 So, I do not have any incremental financial reason to promote the laminates in this collection over other options — see all our research on countertop options to find the product that’s right for you! – Publisher Pam. That jade color will be completely PERFECT for my retro coffee shop! I’m so excited, it came along just in time! For some reason they put them in a different category, I forgot which. Also check out a pattern called Lounge, in a variety of colors, which I think would be pretty cool in a retro kitchen also. They are under the regular laminate line and not park of the virtual design library. Endora and Betty are stock laminate – they are in the main line, not in the Virtual Design Library. OH SO Envious. 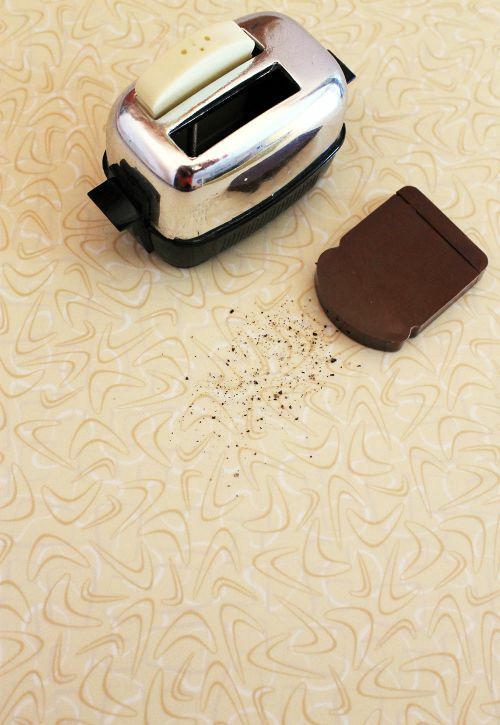 I wonder if I can afford to redo my kitchen? I just put in new laminate counters last year. I need that jade. I NEED it. well done!! !